From Delco taverns to Northeast Philly corner shops, here are our favorite places to dig into Philly's other signature sandwich. We here at Foobooz write about cheesesteaks…a lot. As much as the sandwich has become synonymous with Philadelphia to outsiders, it’s got a longstanding place in our shared civic and culinary history that deserves to be celebrated. 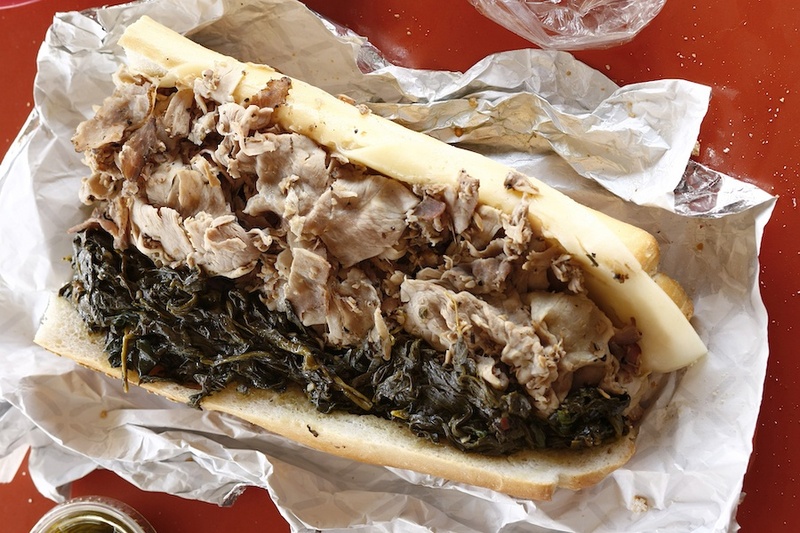 But we all know that Philly’s best-kept secret is another meaty, cheesy, juicy delicacy that’s often overshadowed by its beefy sibling: the roast pork, either thinly sliced or torn into tender chunks and paired with garlicky sauteed broccoli rabe or spinach, sharp provolone, and sometimes peppers (sweet and tangy or spicy roasted long hots, take your pick). Here are our favorite places to dig into a roast pork sandwich in Philadelphia. 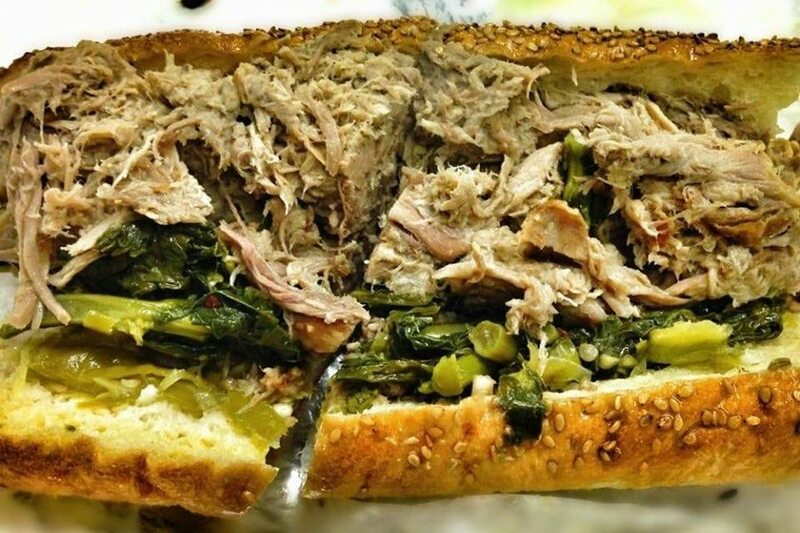 We love this Best of Philly-winning South Philly icon for its juicy, slightly spicy roast pork and tender sauteed spinach — and it doesn’t hurt that they earned an American Classics Award from the James Beard Foundation for it, either. If we could only put one sandwich on this list, this one just might be it — but unless you’ve got some time to kill in the line that regularly wraps around DiNic’s stall in Reading Terminal Market, try to get there before or after the lunch rush. This Best of Philly-winning roast pork sandwich isn’t just worth going to Delco for. It’s worth getting there early on Thursday, the only day of the week it’s served, because supplies are usually exhausted by 1 p.m. Broccoli rabe for breakfast, anyone? Get your roast pork at this expansion of a Wildwood favorite with rabe, roasted long hots, or both (just ask for it Italian-style). This sandwich stalwart, in business under the same family since 1938, serves their thin-sliced roast pork with greens and provolone on a round Kaiser rather than a long roll. Looking for a roast pork sandwich with all the trimmings at this Northeast staple? Ask for the Brous Avenue, named for the street their Mayfair location calls home. 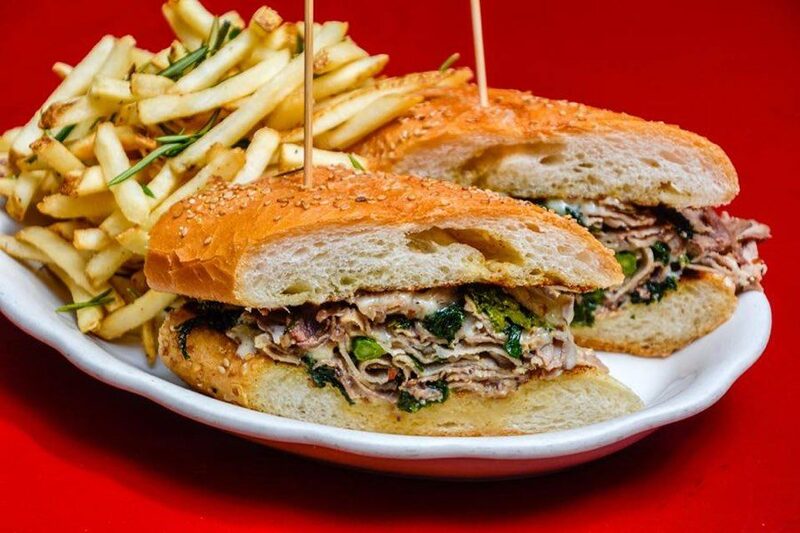 Sure, their menu leans Southern, but the gastropub pays hometown homage with their take on the classic slow-roasted pork sandwich, dressed up with baby spinach and garlicky mayo. We have illicit dreams about pretty much everything on the menu at Peter McAndrews’s Italian-inspired sandwich spot, but the Arista — slow-roasted suckling pig adorned with the holy trinity of sharp prov, rabe, and spicy roasted long hots — just might be our favorite. Even better? You can get it on gluten-free bread, if that’s your thing. Tony Luke Jr. and his sandwich empire have been through a lot the past few years, but those Best of Philly-winning roast sandwiches are still as great as ever (and you can get them at a Phillies game, too). During lunch, Ellen Yin and Eli Kulp’s casual farm-to-table spot serves it own take on the classic, complete with lacto-fermented broccoli rabe to add zing. This neighborhood staple at 8th and Dickinson serves just about every sandwich under the sun — including a roast pork ‘wich you can customize to your liking (rabe or spinach, seeded bread or hoagie roll). Love Paesano’s but can’t make it to NoLibs? This sit-down Italian spot in Delaware County offers a slow-roasted pork shoulder sandwich made with rabe, provolone, and that same Peter McAndrews magic. 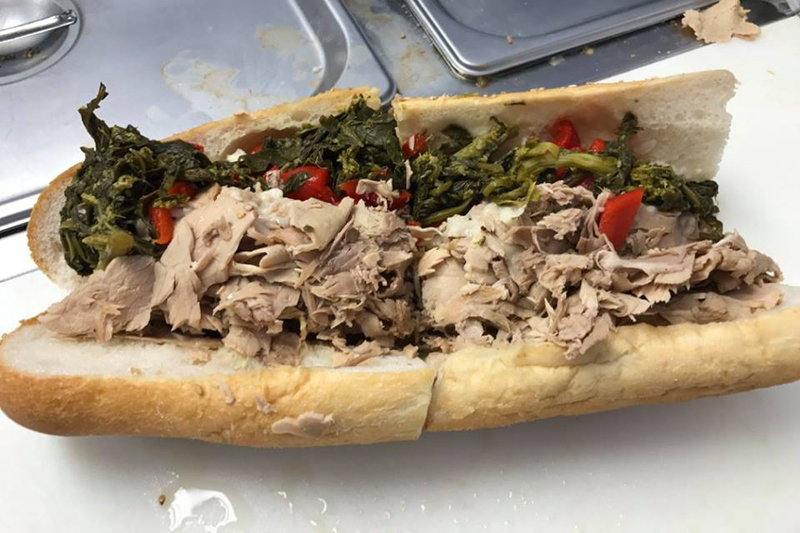 Order up the Roast Pork Italiano at this Pier 40 walk-up stand and take your pick of broccoli rabe or spinach to go along with your meat and sharp provolone. Obviously Marcie Turney and Valerie Safran’s homage to Italian-American homestyle cooking serves a roast pork sandwich, made with thin slices of herb-crusted pork shoulder, sharp provolone, rabe, and a horseradish aioli for kick — on a Sarcone’s roll, of course. 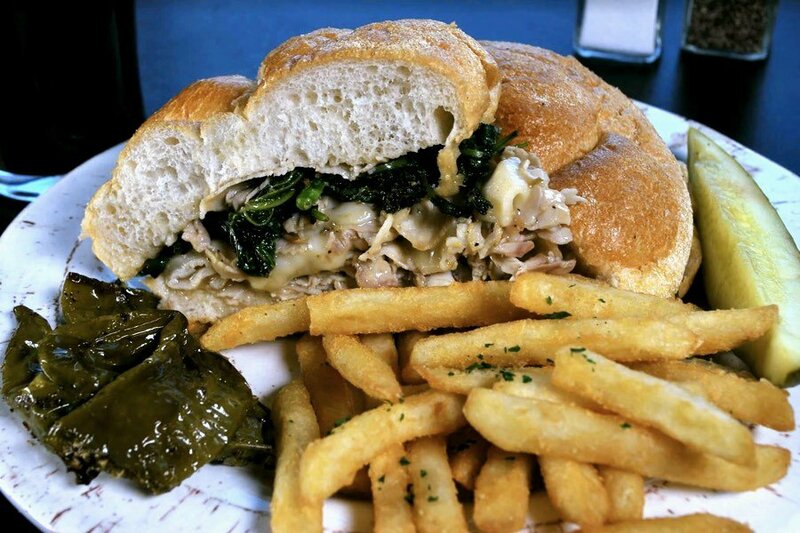 This Delco watering hole has bar food on lock — but don’t sleep on their roast pork Italian, made with thin-sliced loin, and topped with sautéed spinach and sharp provolone. This second-generation neighborhood spot (which recently opened a second location on North 3rd Street) serves just about everything under the sun — including a killer roast pork Italiano. Keep an eye out for their food truck at festivals, too. Tender chunks of roast pork (versus the usual thin slices) distinguish this Best of Philly-winning suburban favorite. Need sandwiches for a crowd? Don’t worry, they cater, too. Delco, you’ve been holding out on us. The roast pork sandwich served on a Kaiser roll at this Delco pub is a sleeper hit. Take yours to the next level and order the Homesteader platter, half hand-carved roast beef and half pork, then dress it up with rabe and provolone. This 80-plus-year-old sandwich stand on South 9th Street, which reopened last fall after the passing of its longtime proprietor, is best known for its sandwiches filled with tripe and tongue. 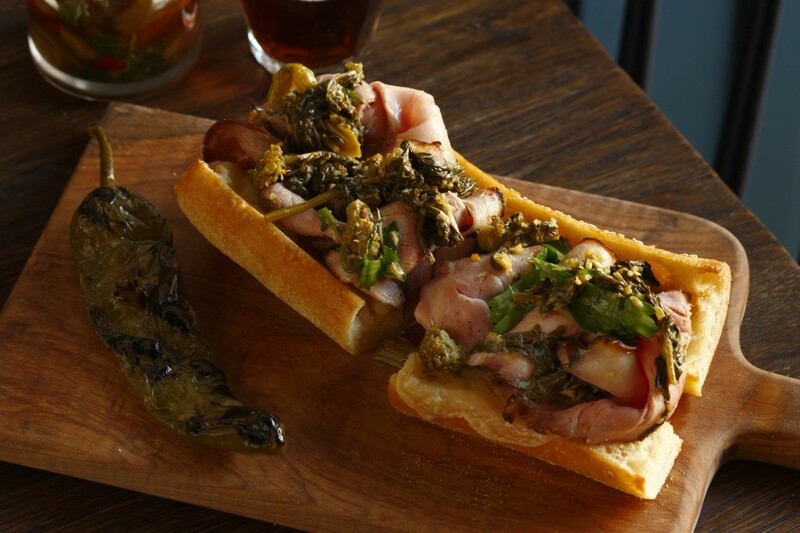 If that sounds like a little much for you, stick with their PBR sandwich — pork with provolone and broccoli rabe. At this 72-year-old Market Street fixture, pork shoulder gets slow roasted for eight hours and pulled apart with a spoon before getting a dose of provolone and your choice of peppers and rabe or spinach. This family-run corner spot is so sandwich-centric that they close for the day when they run out of rolls — so schedule your roast pork appointment accordingly.